Uh-oh! Here comes Rex! Every time Gizmo, Sprinkles, and Wild build something with their blocks, Rex wrecks it! That’s just the way Rex plays. Is there a way to make playtime fun for everyone? Ben Clanton is the author-illustrator of Vote for Me!, The Table Sets Itself, and Mo’s Mustache, as well as the illustrator of the Jasper John Dooley series by Caroline Adderson. He lives in North Andover, Massachusetts. A warm and wacky story that feels both fresh and familiar. This enchanting, quirky quartet will entertain children with what are sure to be repeat readings. Here’s hoping Rex and his friends will be back for more. Full of playful language and with no shortage of alliteration, this is a rousing tale about cooperative play. ... The book design is particularly well done with a pleasing square shape and full-bleed illustrations. ... Clanton’s minimalistic cartoon art is a restrained cousin to Mo Willems’s “Elephant & Piggie” books. This book is a good addition for young readers, so better practice up pronouncing “awesomerific” for the numerous read-alouds to come! Clanton understands the comedic possibilities of the page turn. ... Sweet-tempered readaloud humor (“rawry,” Rex apologizes as he takes a bite out of a block) and Gizmo’s cerebral counsel (he explains his plans with blackboard diagrams) add charm, and it’s impossible to dislike Rex, who looks like a tiny, babyfied Godzilla—his destructive impulses may even spark a little silent cheering. An overenthusiastic T. Rex does what dinos do best: wreak total destruction! 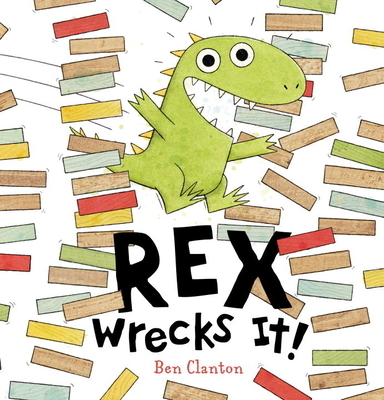 ... Rex is less a bully than simply a toddler stand-in, finding his fun in destruction and then, eventually, construction. The three friends' solution to engage Rex in play rather than ostracize him is a welcome message of inclusion. ... The ink, pencil and watercolor art imbues Rex with a joyous energy. ... All told, a fine little fable. You can't hate a guy who's having this much fun, and you can't help but love a book that does the same. Clanton has used an expose of ink, pencil and watercolor, along with utilizing white space for the background. Important lessons are learned with the value of cooperation.